It is clear that the City of New West is full of people who care. People who care about local food, the local economy, inclusivity, diversity, community connectivity, and a countless number of groups of people engaged in caring for the environment. In particular, groups like the New West Environmental Partners, the New Westminster Community Garden Society, and the Glenbrooke Ravine Cleanup, show that through rain or shine, community members of all ages are dedicated to getting their hands dirty in the name of sustainability. To add to this commitment to environmental sustainability, the City of New Westminster is currently in the process of creating an Environmental Strategy Action Plan (ESAP) that takes the current vision and goals of the City, citizen and stakeholder input and concerns, as well as best practices from environmental planning around the world, to create a document intended to create a sustainable living environment for the community now and for many years to come. 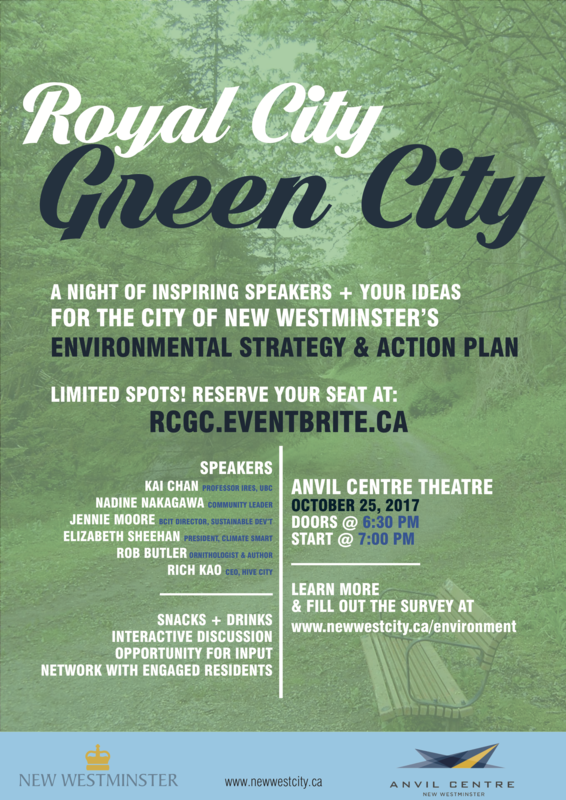 The plan has already gone through many rounds of stakeholder consultation, but on October 25th, the entire city is invited to Royal City, Green City: Inspiring Speakers + Your Ideas for the City of New Westminster’s Environmental Strategy and Action Plan (link to Eventbrite). This is an all-ages event that is an opportunity to listen to inspiring talks on a wide range of sustainability issues, to speak to your concerned neighbour about these very issues, and to give feedback on the first draft of the plan. Residents of New West: this is the perfect opportunity to affect real change, to put forth your input, and to lay the foundation for the City to create a new Plan – one that is not just for its citizens, but by its citizens. Snacks and drinks will be provided by the City in exchange for your presence, thoughts and ideas. Limited spots are available so reserve yours now at www.rcgc.eventbrite.ca. Here’s to a vibrant, healthy, and livable city, with the help of residents like you!